Let’s End Cannabis Prohibition Now!!! We’ve taken the first steps here in Washington State by passing I-502 and starting the legalization process. We’re at an in-between spot right now. A place where the Federal Government looms over our burgeoning cannabis movement and leaves us unclear as to whether it will fall and decapitate legalization or continue to bide it’s time and watch how the legalization process plays out in the States before it acts. Cannabis is a Federal Schedule I Narcotic. What does this mean excatly? So as you can see, our Government has no problem turning a blind eye to the truth. Even when the truth is so blatantly obvious to everyone else. But what are we to do about it? What power do we have? We have the power of our vote! Let’s end Federal Cannabis Prohibition and the Scheduling of Cannabis here in the USA. Send your representatives an email, call and leave detailed messages with their staff or on their office’s voicemail, send them a hand-written letter via the Postal Service. Follow your representatives on Twitter and Facebook. Tweet to them and about them. Send messages to them on Facebook and their other social networking accounts. Post open letters to them on not only on their campaign and official pages but on their personal accounts as well. Let them know that by the Government’s own admission, Cannabis has medicinal values and that you’d like the Federal Scheduling of Cannabis to be lifted. The will of the citizens of Washington and Colorado to legalize cannabis has been made clear by their vote. Tell them to respect the will of the people by formally declaring that they will allow the States to implement systems of legalization without Federal interference. Let them know that you’re tired of hearing about Federal letters being sent to medicinal cannabis providers. It’s time to spend our tax dollars in ways that benefit society instead of policies and programs shown to be decidedly against both the will and the interests of the people. Make sure your representatives understand that you won’t vote for them again and that you’ll encourage everyone you can to follow suit unless they start honestly dealing with cannabis as an issue. We can do this! We have started to create real legalization but we won’t really have it until we end the Federal Scheduling of Cannabis. Join us and let’s tilt the scales of justice in cannabis’ direction. Be polite, engage in conversation, share your knowledge with everyone around you, get others involved, and remember to write your representatives frequently and ask them what they are doing about correcting the Federal Scheduling of Cannabis. Here are some Drug War facts taken from Marijuana Policy Project and Safer.org – share these with your representative, family and friends. There have been almost 9.5 million cannabis arrests in the United States since 1995, including 872,720 arrests in 2007 – more than for all violent crimes combined, and an all-time record. Cultivation of even one cannabis plant is a federal felony. A person must serve a 5-year, mandatory minimum sentence if federally convicted of cultivating 100 cannabis plants. This is longer than the average sentences for auto theft and manslaughter! Federal government figures indicate there are more than 41,000 Americans in state or federal prison on cannabis charges right now, not including those in county jails. That’s more than the number imprisoned on all charges combined in eight individual European Union countries. According to estimates by Harvard University economist Jeffrey Miron, replacing cannabis prohibition with a system of taxation and regulation would save between $10-14 billion a year in reduced government spending and increased tax revenues combined. Because of cannabis prohibition, America’s largest cash crop is often grown by unregulated criminals, in environmentally damaging locations such as national parks and wilderness areas. Such problems are virtually unknown with legal, regulated crops such as tobacco or wine grapes. The arbitrary criminalization of tens of millions of Americans who consume cannabis results in a large scale lack of respect for the law and the entire justice system. The federal government is actively blocking research into cannabis’ use as a medicine. In fact, several researchers have filed lawsuits against the federal government, charging it with obstruction for failing to act on an application for approval to grow high-potency, research-grade marijuana at a university facility in Massachusetts. The researchers who filed suit are barred from obtaining research-grade marijuana from other countries, and the poor quality of the federal government’s marijuana makes its use unfeasible; thus they are unable to conduct research into marijuana’s medical use. Sufferers of cancer, glaucoma, AIDS or HIV, Crohn’s disease, hepatitis C, and multiple sclerosis have found relief by using cannabis. It is also used to treat cachexia, anorexia, and wasting syndrome; severe or chronic pain or nausea; seizure disorders (such as epilepsy); arthritis; migraines; and agitation of Alzheimer’s disease. Many people die from alcohol use. Nobody dies from cannabis use. The U.S. Centers for Disease Control and Prevention reports that more than 37,000 annual U.S. deaths are attributed to alcohol use alone (this figure does not even include accidental deaths resulting as an incident of alcohol use). Interestingly, the CDC does not even have a category for deaths caused by the use of cannabis. Alcohol use damages the brain. Cannabis use does not. Despite the myths we’ve heard throughout our lives about cannabis killing brain cells, it turns out that a growing number of studies seem to indicate that cannabis actually has neuroprotective properties. This means that it works to protect brain cells from harm. If you are concerned about cannabis being associated with lung cancer, you may be interested in the results of the largest case-controlled study ever conducted to investigate the respiratory effects of cannabis smoking and cigarette smoking. Released in 2006, the study, conducted by Dr. Donald Tashkin at the University of California at Los Angeles, found that cannabis smoking was not associated with an increased risk of developing lung cancer. Surprisingly, the researchers found that people who smoked cannabis actually had lower incidences of cancer compared to non-users of the drug. 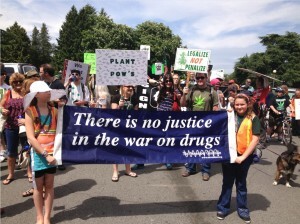 Seattle Hempfest has created a new web page End Federal Schedule of Cannabis. Visit it and share it and this blog! Get the word out! Let’s end Federal Prohibition!